Travel Hackers are a generous bunch, if you didn’t already know. When I attended the Chicago Seminars last fall, I found that out first-hand. So when I heard that one of my area’s local TV stations was having a phonathon tonight for donating miles to Make-A-Wish, I jumped right in. For those that may not know, Make-A-Wish is a charity that provides dream vacations (such as trips to DisneyWorld) to children with threatening medical conditions. 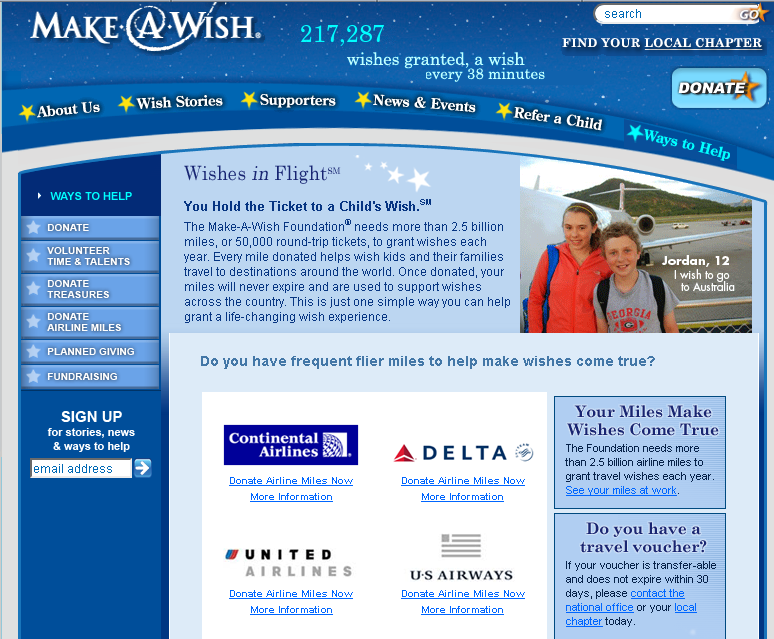 To donate to Wishes In Flight, which is the mileage side of Make-A-Wish, you can click here. We as travel hackers/points junkies are accused (whether true or not) of taking an awful lot, so I think it is always great to give back–no matter how little. You’ve probably been blessed a lot in life, even in ways you don’t realize, so give back for once. No phonathon required! If you liked this post, why don’t you sign-up to receive free blog posts via email (only 1 email per day!) …because then you’ll never miss another post or trip report!